Welcome to shopping with us, your satisfaction is our most motivation. 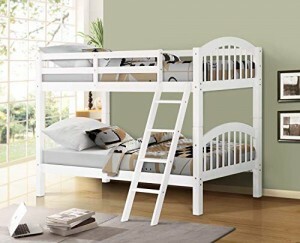 Harper&Bright Designs Solid Hardwood Twin Bunk Bed is the ideal choice for any bedrooms. Crafted from solid pine wood, sturdy and exceptionally stylish. Features full length guardrails and an integrated ladder. *Inner Dimensions: 75″L x 40″W x 30″H. *Outer dimensions: 79.5″L x 42.5″W x 62″H. Items may slightly different from photo in terms of color due to the lighting during photo shooting or the monitor’s display. Materials—Made of environmentally-friendly, high-quality solid sturdy wood. Functional— A great solution for space-saving needs, easily and safely converts into two individual beds for versatility. Convenient—Designed for simple construction, easy to set up, comes with required hardware and step-by-step instructions. Security— With a ladder and full length guardrails. Each wood shelf is crafted individually by specialists and quality tested for a smooth finish. Dimensions—52″W x 107″L x 18.5″H.